The controversy surrounding Metallica's latest album shows no sign of abating. 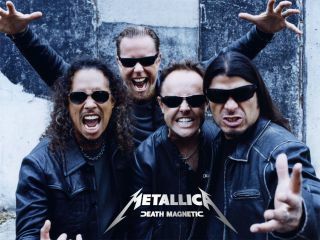 In a shock new development, members of Metallica's official forum have received an email from an anonymous source containing a remixed version of Death Magnetic track Broken, Beat & Scarred. Apparently the work of a "name" metal producer who wishes to remain anonymous, the mix was created using six tracks extracted from the Guitar Hero video game. In addition, the Black Album snare drum sound has been sampled and triggered throughout. "If you love the songs on Metallica's new album, Death Magnetic and think the band has written some of its best material in years, but were very disappointed with the CD's sound/production, then this is for you. A "name" metal producer who has worked with some of the top bands in the genre has put together this version of Metallica's Broken, Beat & Scarred using only six separated/extracted tracks from Guitar Hero. The producer, who is a long-time Metallica fan, says: "All there is on Guitar Hero is six tracks - stereo drums mixed with the vocals in, bass and stereo guitars. I actually went through and put the 'Black Album' snare in on every hit so I could fire reverb off it, but if I had the proper files it'd be so slammin'." This is only a hint of what could have been. Remember - this was created using only six tracks! If you like what you hear, share it with your friends, but please remember: This audio file is to be used for comparison purposes only!!!" "It just sounds much better and less ear-fatiguing when you A/B it with the CD. The snare triggers he has dropped in from the Black Album are quite reverby, but not in a bad way, certainly a nicer snare sound. "There's more separation and definition throughout. Kind of sounds a little glossier and less raw as a result, but easier to listen to. Certainly would be interesting to hear the mystery man have a go at remixing it from the ground up rather than just using the GH files." UPDATE: Despite English producer and mix engineer Andy Sneap being the name most frequently thrown around in forum discussions regarding the mystery producer's identity, last night Sneap denied any involvement. Posting on his own forum, Sneap commented: "I'm a touch busy with Megadeth live to be worrying about Metallica Guitar Hero remixes right this second." With Sneap ruled out, the mystery producer's identity is still unknown. Have you heard it? What do you think?